Karen Tote is a purse that I made for my friend Karen. She is a very delightful lady and the color showcase her sunny personality. 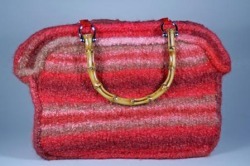 This purse is worked in 1 strand throughout using St st. This purse is worked in 5 pieces; purse body (make 2), purse bottom with purse sides and purse top (2). 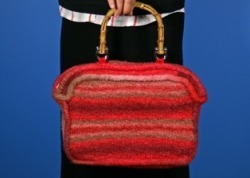 The purse sides are worked by picking up stitches from the purse bottom and the purse top are knitted in a long rectangle pieces, then attached to the top and the side of the purse.